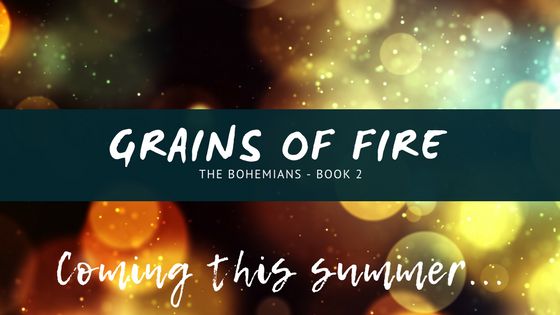 People have been asking me about Grains of Fire and what is going on and when they can get their hands on this anticipated sequel, and I have good news and bad news...so let's just rip this band-aid off. It's not going to be this month. I know. I know. I said May 2018, and it's May 2018, but this whole year has just been a freight train. That's the bad news. But here's the good news. Grains of Fire is done. DONE. That feels so good to say. So why is it not in your hands right now? Well...because it's done, but this book is so epic and so complex that I want to be perfect. I want it to have that magic touch. I want to do it justice more than anything. Everything in Grains of Fire is one step above Notes of Magic. There's more action, more romance, more mystery, more magic, more everything. The stakes are higher and the threat is bigger. I will be spending the next month, starting Monday, revisiting every chapter, making sure it has the perfect amount of detail, heart, and action. I want to add some backstory scenes that will bring you closer to the character this book really revolves around, and that is Yuri (love him or hate him). I want to make every scene in the Cirque shine (and there are a lot). And this scene at the end...oh man. It has to be perfect. So, that's where I'm at right now. What I can offer you in exchange for good news is that if you follow me on Instagram, I will post every single day about where I'm at and how much closer you are to reading it. I will bring you along in the whole process. So for now, plan on taking this sequel with you on your vacation this summer. I can promise you that much. At EssayAssignmentHelp.com.au, you are guaranteed to get quality essay online. Know more about essay help online.